Another addition to my antique Himalayan Books collection. This time another one from Roerich called the Altai Himalaya. 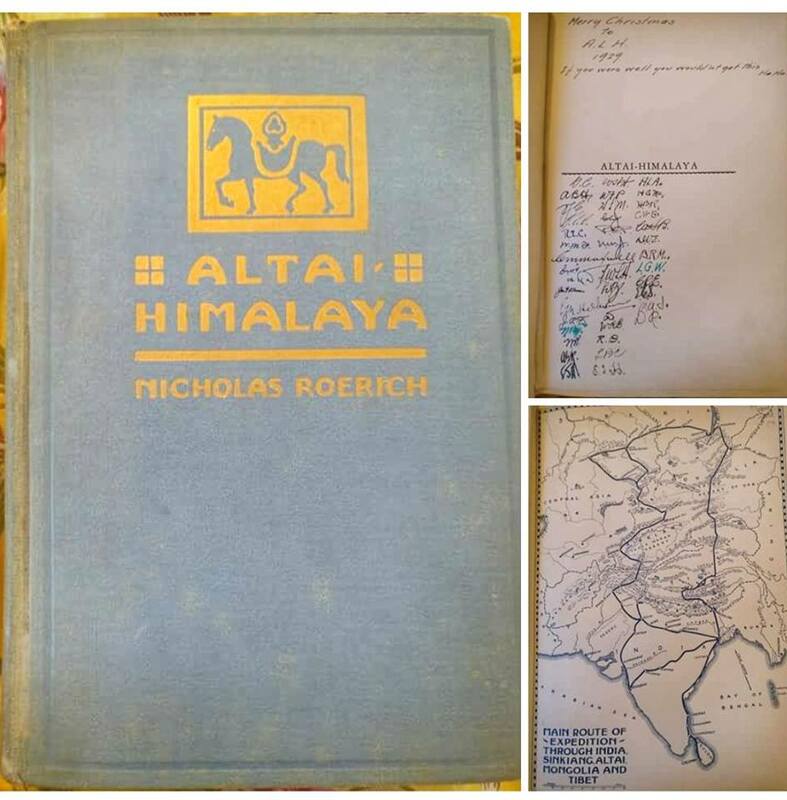 This is a Travel Diary of Nicholas Roerich and includes 21 reproductions from his paintings. "Roerich American Expedition after many hardships has reached the Himalayas.Thus ended the big Central Asiatic Expedition. Many artistic and scientific results. Already sent several series of paintings to New York. Hope last sending from Mongolia safely reached you. Many observations regarding Buddhism. Expedition started in 1924 from Sikhim through Punjab, Kashmir, Ladak, Karakorum, Khotan,Kashgar, Karashahr, Urumchi, Irtysh, Altai Mountains, Oyrot regions, Mongolia, Central Gobi, Kansu, Tsaidam and Tibet"
In today's time and age this is probably every explorer's dream but it is impossible for anyone to do as the traditional Ladakh to Yarkand/ Kashgar route has been shut for a long time. I had done a post on that Route some time ago. Coming back to the Book I managed to land up. Its an original 1929 print, presented by someone to a gentleman called ALH for Christmas that year. More interestingly it is signed by a Group of people who I have been trying to figure out. If someone can recognise any of these autographs it will indeed be great. thought that I deserved to have this one as well. I got it at a very neat price :) And currently Im enjoying reading it in Kashmir.